This exquisitely-wrought temple-like chaitya was undoubtedly destined for a monastery or household shrine. The chaitya is subordinated to the elaborate temple-like substructure, a two-story plinth arranged as a mandala of 20 angles. Each niche in the upper story holds a tiny, movable Transcendent Buddha. Between the projecting tympanums (toranas) at each corner are kinnaras, mythical beings half-bird, half-human. 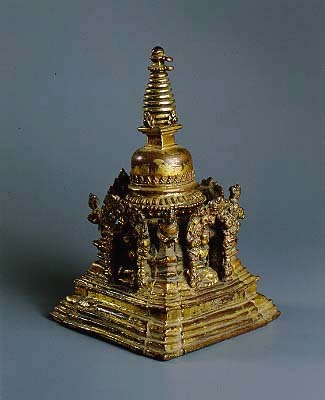 Against the nine-ringed finial are shields embedded with jewels of the color associated with the Buddha enshrined below. The crest jewel, a crystal, represents the Buddha's cranial bump, the ushnisha. The pair of rings beside the finial probably once held a sacred canopy.